So maybe you’ve heard – there’s something new going up in downtown Buffalo, and it going it be big – really (REALLY) big. Unlike the new kid on the block that tries his or her hardest to fit in, 500 Pearl will stand out in the Buffalo Skyline. 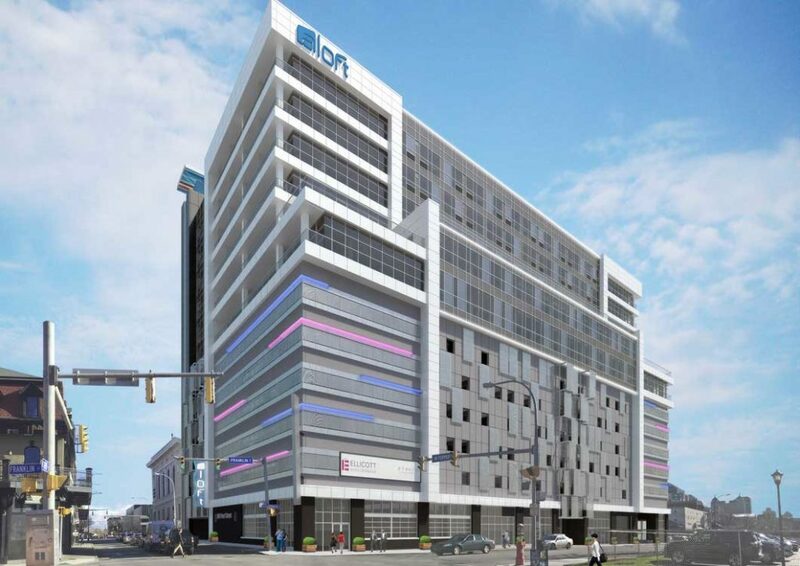 One of Ellicott Development’s hottest new projects will combine the renovation of a historic Buffalo property with the construction of a sleek, contemporary 12-story mixed-use high rise. For those of you who remember the Buffalo Christian Center, it will once again bustle with activity as it is incorporated into this luxurious, state of the art building where you’ll also find a swanky tech-friendly, Aloft hotel, high-end luxury apartments, Class A office space, ideal ground floor retail and restaurant space, a banquet facility, a lounge, a pool, a fitness center, and meeting spaces. Now you might be thinking about parking? Not to worry, 500 Pearl has that covered – literally. A 5-floor parking ramp is concealed within the cool, exquisite façade. Open terraces, glass curtain walls, and mixed medal and concrete will dominate the exterior for an external view of sheer elegance, luxury and style. On top of all that, you can’t beat the address. 500 Pearl, is smartly located near the Medical Campus, county, state and federal Courts, the Theater district, Canalside, and Larkinville, just to name a few of Buffalo’s commercial and entertainment hubs. Expanding your business? Envisioning a chic new office? Starting something fresh? 500 Pearl should be your new address. Let us help. Ellicott Development is now leasing Build-to-Suit office suites on the 7th and 8th floors – Imagine, a custom office with a view! And you know what they say about first impressions…. This is your time to make a move. Your dream is our vision! See more information on 500 Pearl.